How to flash Karbonn E5? which has a MTK 6261 CPU. 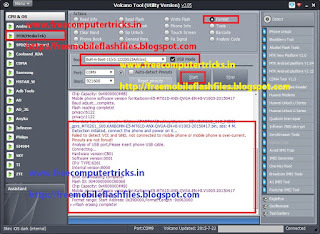 The below is the complete process to flash the Karbonn E5 with Volcano tool V3.0.5. The phone has MediaTek MT6261 CPU and can be flash or format using any china flash tool, here is the example of Volcano Box and how to flash this model. The flash file size read with Volcano Tool is 4MB.